Acupuncture is a safe and effective treatment that involves the placement of thin, sterile needles into precise points on the body. 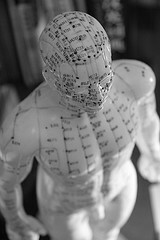 The selection of specific acupuncture points is determined by each patient’s signs and symptoms; thus, each treatment is tailored to meet individual needs. Rather than masking symptoms, acupuncture works by activating your body's natural healing process and restoring homeostasis. Clinical research has shown that acupuncture increases blood flow, stimulates nerves located in muscles and other tissues, and promotes the release of neurotransmitters and endorphins, the body’s natural painkillers. Acupuncture has great pain relieving abilities without the toxic side effects associated with many pharmaceutical interventions.